I’m starting up a new monthly blog feature: a short roundup of things to do in Vancouver every month, highlighting some of my favourite events and activities in the Vancouver region that I feel are worthy of putting on your radar. Yes, January might be a crappy month for its rain, cold, and darkness, but if you’re going to be in Vancouver in January, it’s not a lost cause. When Vancouver’s evenings are cold and dark, the PuSh Festival couldn’t come at a better time. The PuSh International Performing Arts Festival is an eclectic curated program of international theatre, film, dance, performance art, bands, singers – all in various venues around town. I like to attend a few events ever year, often to see performers I’ve never heard of before, and almost all the time I come away satisfied, invigorated, and inspired. I first attended in 2009 when I saw Dean & Britta perform “13 Most Beautiful: Songs for Andy Warhol’s Screen Tests” at the Vogue Theatre. In 2012, I discovered the music of Don McGlashan, the legendary Kiwi singer songwriter, at Performance Works on Granville Island. A week later, it was the quirky elusive Mary Margaret O’Hara who charmed us with her presence. Then there were last year’s modern dance performances, and that time in 2010 when I stumbled upon the cinematic performance art “La Marea” happening in the windows and streets of Gastown. It’s actually a pretty cool festival. It’s how I imagine Berlin must be every night. In a way, PuSh a nebulous festival. If you didn’t know about it happening, you wouldn’t notice it going on. And yet, all you have to do is attend an event and sip your red wine, and this delightfully seductive realm of PuSh organizers, volunteers, supporters, and artists reveals itself, and you start to wonder why you aren’t going to more shows. Look up the festival program online, buy tickets to events that intrigue you, and don’t let your unfamiliarity stand in your way. “Club PuSh” is what Performance Works on Granville Island becomes late at night during the PuSh Festival. It’s sort of cabaret, social venue, and festival headquarters. If you want to meet volunteers, performers, and organizers, this is the place. For more details (tickets, artists, venues, etc. ), visit www.pushfestival.ca. Although it’s extremely popular, Dine Out Vancouver can be a hit or miss. However, I do recommend looking into the events they put on, as they’re often a step above the regular Dine Out 3-course-meal-at-set-price experience, taking you on food tours, private parties, and unusual dining adventures. For the foodies out there, check out their events calendar and reserve your tickets soon as they often sell out. Last year we went to an event called PuSh Feast – a Dine Out and PuSh Festival partnership. We arrived at Salt Tasting Room and were taken to their underground cellar long table, where we enjoyed a three course meal with wine pairings with other Vancouver arts enthusiasts. We were then led en masse around the block to the SFU campus at the W2 building to see, and for some, participate in “Gob Squad’s Kitchen“, an interactive theatrical experience based on Andy Warhol’s Kitchen. At the traditional end of the spectrum, we also attended Dine Out event at Hawksworth called “Side Dishes”, where we sat at one of two long tables in their private York Room upstairs, and were served some of Chef Hawksworth’s most notable dishes, complete with wine pairings. It was a pricier affair compared to the regular Dine Out menus, but tax and tip were included in that price, and for a high end gourmet dining experience in one of Vancouver’s best restaurants (with dishes introduced by the native Vancouverite chef himself), it was more than worth it. It was fun, the food was delightful, and we both felt it was excellent value. Highly recommended. Buy your tickets early as they will sell out days and even weeks before the event takes place. Hawksworth has its Side Dish menu for 2015 up at hawksworthrestaurant.com/event/dine-out. For the full list of Dine Out Vancouver events, go to www.dineoutvancouver.com/events. You can also buy tickets from the site as well. Whistler’s a 90 minute drive north of Vancouver, and a popular day trip destination. In January, it’s a snowy wonderland vibrant with skiers and snowboarders. Even if you don’t ski, there’s still a lot to do – snowshoeing, dogsledding, ziptrekking, shopping, gondola rides, or even imbibing in the après ski scene. My new favourite activity, however, is a short drive north of the village at Scandinave Spa. Scandinave is a small chain of Scandinavian spas with a location in Whistler. They have series of outdoor hot pools (not unlike a hot springs), ice cold plunge baths, and a variety of indoor saunas and sitting rooms. In the snow and in the night (which comes as early as 4:30pm in January in Whistler), the setting is absolutely magical. I should also mention that it’s like a silent retreat. You’re not supposed to talk during your entire stay. Try suppressing your screams as you plunge in the ice cold bath, or try not to laugh as your friend is trying to faux sign language that it’s time to get out of the hot pool and into the sauna. I’m not normally somebody who seeks out spas during my leisure time, but this is truly a blissful experience worth pursuing in January, when you need a little R&R away from the city. Prices are $58 for the full day, not including massages (which are extra). They recommend a minimum of three hours in the pools, but we were satisfied with two hours. We visited in the dark, a few hours before close. We had the place practically to ourselves! For full details, visit: www.scandinave.com/en/whistler. Sure, you can also go snowshoeing on Cypress or Grouse, but my snowshoeing experience revolves around Mount Seymour, the eastern-most of Vancouver’s three North Shore mountains. I’ve snowshoed there twice, and as long as they have enough snow, it’s a beautiful little winter wonderland up there, and a great way to be active with friends and have fun in the snow, without having to know how to ski or snowshoe. You simply drive up to the top of the mountain, park in the lot, walk into the snowshoe rental shop, rent your snowshoes and buy your snowshoe pass, and you’re free to explore Seymour. I like recommending snowshoeing because if you can walk, you can snowshoe, and you don’t have to have any experience to enjoy it. If Vancouver’s dark grey skies and rain are getting you down in January, all you have to do is drive up to the top of Seymour, and the grey disappears into bright white cheerful snow. Seriously, it’s a complete change in environment and it’s hard for it not to improve your mood. It’s the quickest way to escape the gloomy grey. The first time I went snowshoeing was in the winter of 2008, when I joined colleagues on a guided snowshoe chocolate fondue tour. We trekked through the forest and up to a snowy ledge where we overlooked Vancouver’s city lights while enjoying a chocolate fondue by tea light, and then slid back (literally, some of us slid down the snowy hillsides), and all in all, tons of fun. The second time I went snowshoeing was in January 2013, when a group of us drove up to Seymour, rented snowshoes, and trekked up to a peak. It was rainy down below in Vancouver, but at the top of Seymour, it was bright, white, snowy, and cheerful. I don’t get up to Seymour nearly enough in the winter and honestly? I’m surprised I don’t already own snowshoes. If you haven’t snowshoed yet, what are you waiting for? The season’s fleeting. You can drive up Seymour (if you have winter tires) and park for free, but if you don’t have a car or winter tires, you can access Seymour by their shuttle bus that picks up at Lonsdale Quay Seabus station – easy access from downtown Vancouver. Info is at www.mountseymour.com/shuttle-bus. Snowshoe rentals include the trail pass and cost $28 for adults, $24 for seniors and youth (13-18), $18 for children (6-12), and under 6 are free. Chocolate Fondue tours happen every Saturday at 7pm. It’s for people 13 years old and older. You have to pre-book by 4pm the day before at www.mountseymour.com/snowshoe-tours. 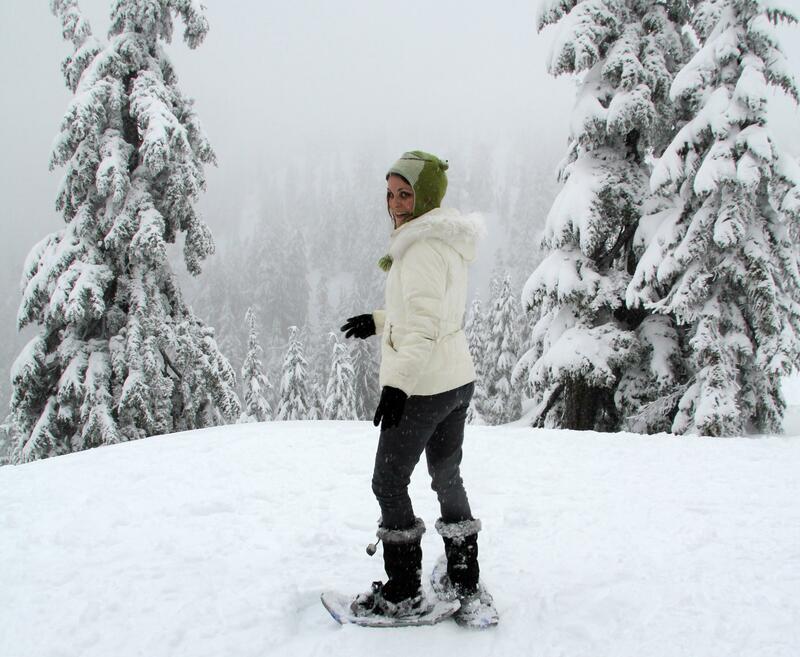 Mount Seymour has other snowshoe tours, some that are better suited for kids and babies. All the details you’ll need is at www.mountseymour.com/snowshoe-tours. Yup, it’s pretty amazing. Highly recommend it. Dine Out sounds like a fun event, and I have good memories of the Fringe Festival from just over a year ago! Looking forward to the next edition Robyn! A belated thank you, Sarah! Ultimately, it was an extremely short winter here. After I published this, temperatures warmed up and the local mountains lost all their snow! Even Whistler had little to no snow down below at the base of the mountain where Scandinave Spa is located. I was so hoping to snowshoe around Christmas but no snow!! Of course there’s some now that I’m gone. A belated thanks, Arnette! So you no doubt must have heard by now, all that snow that fell when you left melted a few days later. Seriously, it’s been the worst winter for snow. Worse than during the 2010 Olympics, even!